The other day a new friend asked me what do I do. To be simple, I said “I am a learning technologist…” She answered “oh, that’s good. My nephew works in IT, like you, he fixes computer problems…”. I knew she has seen me as a “Technician”, which many people are thinking it in the same way too. However, I know I am not a technician in my area as I don’t look after computers, don’t install software for users, don’t register people’ mobile devices on the university network, don’t work at helpdesk and answer students’ requests, etc. The vocabulary “technologist” wasn’t in the 1990s Oxford dictionary. It appeared in some of the 2000s dictionaries. A person employed to look after technical equipment or do practical work in a laboratory. An expert in the practical application of a science. A person skilled in the technique of an art or craft. 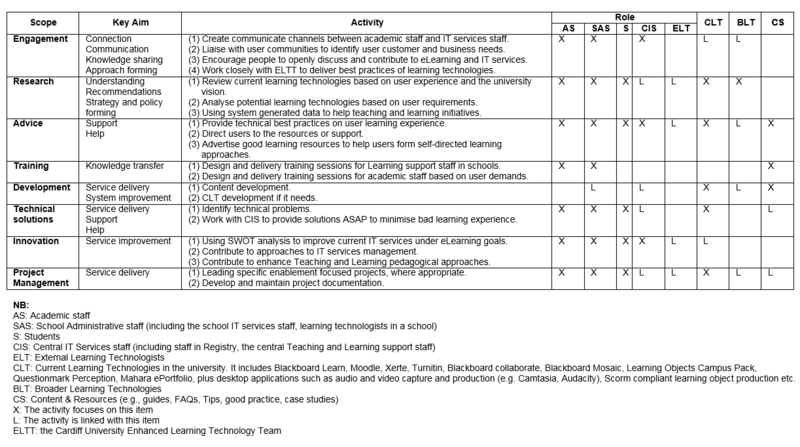 Oliver, M. (2002) What do Learning Technologists Do? Innovations in Education and Training International, 39 (4), 245-252. Conole, G. (2004), ‘The Role Of Learning Technology Practitioners And Researchers In Understanding Networked Learning‘, Proceedings of the Networked Learning Conference. Jones, C. (2004), ‘Theory and Practices of Learning Technology‘, Proceedings of the Networked Learning Conference. Armitage, S. et al., (2004), ‘Supporting Learning Technology: Relationships With Research and Theory‘, Proceedings of the Networked Learning Conference. Huppe, I. (2013) Learning Technologists at Oxford Brookes University – Jacks-of-all-trades? BROOKES eJOURNAL of Learning and Teaching, 5(2). Hyndman, J. (2014) A Learning Technologist at the Westminster Institute of Education BROOKES eJOURNAL of Learning and Teaching, 1(1). The ALT-C Awards since 2007 are listed here. The winners are good examples of what learning technologists do. Be the point of expertise, reference, and recognised knowledgeable contact for enablement of IT services within your area of expertise, providing guidance and support to the University. Work with the academic and administrative staff to provide both pedagogical and technical support (advice and guidance), for face-to-face learning and online / distance / eLearning goals, particularly with regard to enhancement of learning through the use of technology. Encourage and facilitate the dissemination of best practices in the use of learning technologies. Regularly engage with service managers, customers, and end users in order to understand the current usage of IT services, including the user experience, limitations, end user capability, and understanding of the capability of service offerings. Contribute to an enablement strategy for your area of expertise, liaising with end user communities to identify customer and business needs. Proactively manage customer expectations pertaining to service capability, creating communication channels to advertise information on service capability and usage. Identify competencies, skills, and development required to maximise the benefit from IT services, assessing the effectiveness of activities completed. Plan, design and deliver demonstrations and development activities for staff across academic and professional service departments on the use of the VLE and various technologies within teaching, learning and assessment. Develop staff development plans and appropriate learning materials. Develop and facilitate technical and pedagogical demonstrations of the use of the latest content developments and teaching tools. Understand new requirements and implement them to the e-Learning platform. To be specific, I tried to draw a draft of the key activities, connections, and Input/Outcomes in my role together. Hope this first step helps me to make the role clearer.